Shampoo removes, bacteria, dirt and product build up from the hair. Shampoos also remove your natural sebum coating. Therefore you should always follow every shampoo with some type of conditioner to help re-balance your hair. Conditioners replace moisture removed during cleansing. 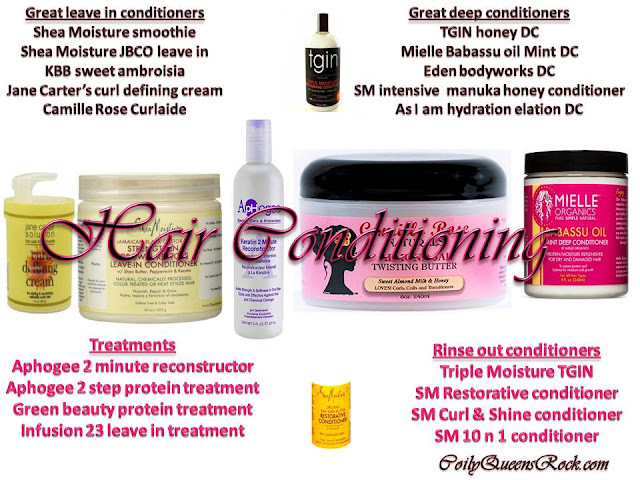 Conditioners also add strength, softness, shine and elasticity to the hair. These are products formulated to apply to the hair and leave on for 2 to 10 minutes, then rinse off. No heat is needed for this type of conditioning. How long you keep the conditioner own will vary per the product. These conditioners are not formulated to be left on the hair, unless the bottle specifies such. It is very important not to use a rinse out conditioner as a leave in. Who should use regular conditoner? Usually a moisturizing conditioner you leave on the hair, cover with a plastic cap for 10 to 20 minutes. This will vary depending on the deep conditioner brand you use. Deep conditioners come in the forms of masques or creams. The leave in conditioner is your most important hair product. Afro curly hair requires continuous conditioning. A leave in comes in the form of liquid, cream or lotion. Creamy leave ins are the most moisturizing and the most popular. These are conditioners formulated with ingredients that can be elft on the hair. A leave in conditioner and a moisturizer provide the same function. A good leave in conditioner will also be a great style product for your hair. So it gives you moisture and hold for your style all day.